Newport has long catered to those who travel by sea. Newport is as much a feeling as it is a city. I live here, and I am the happier for it. 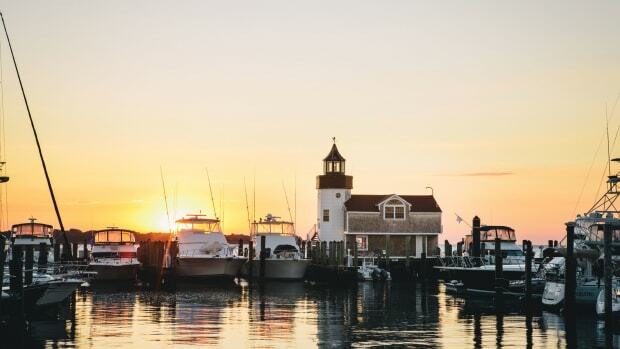 Located on the southern tip of Aquidneck Island, Newport anchors the state of Rhode Island to the North Atlantic through Rhode Island Sound. This easy access to the sea creates a sense of freedom among residents and has for centuries encouraged seafarers to take shelter in the city’s safe harbor. When fog blankets the area, the horn at Castle Hill Lighthouse sends its mournful voice into town, reminding everyone that a path to the world lies nearby. A boat is all you need. 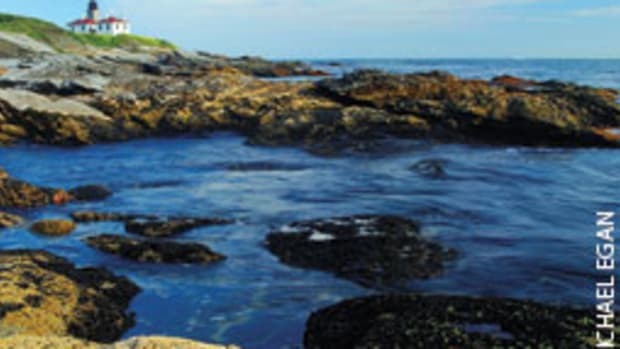 Colonists founded Newport in 1639, when Aquidneck Island bore the name Rhode Island. The town’s eight founders and first officers — Nicholas Easton, William Coddington, John Clarke, John Coggeshall, William Brenton, Jeremy Clark, Thomas Hazard and Henry Bull — continue living as street names, buildings and landmarks. Easton’s Point on the flats opposite Goat Island is one such area. Tiny Newport was incorporated as a city in 1784. It occupies an area of 11.4 square miles — 7.7 of it land, 3.7 of it water. Its permanent population was listed as 24,027 in 2013. During the tourist season, roughly mid-May through mid-October, the population swells dramatically. Each cruise ship that drops anchor dumps about 3,000 visitors ashore. Although these passengers clog the sidewalks and stores, walking among them is a lesson in languages — German, French, Chinese, Japanese, Swedish, Norwegian and others. 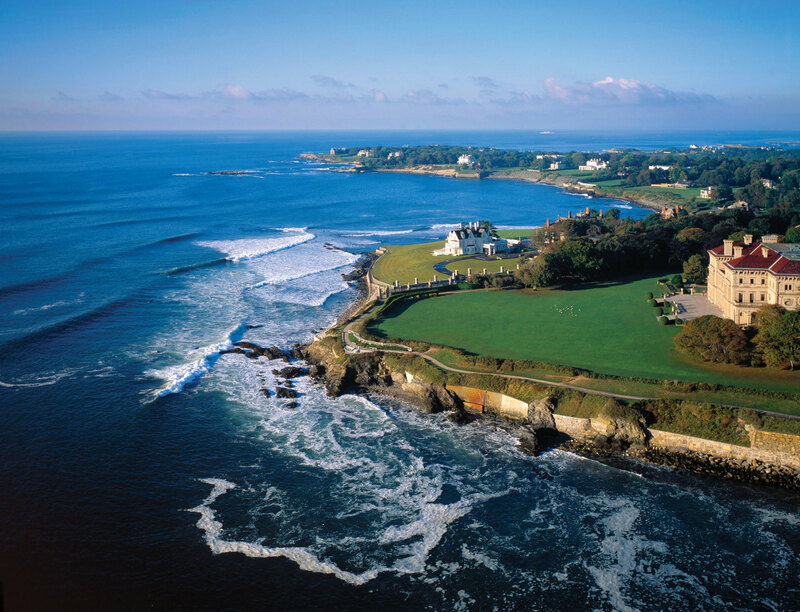 Their presence both thrills and annoys us — it’s just part of life in Newport. Any time is a good time to visit — even the dead of winter — but the height of boating season is the most exciting. Boats begin returning to their moorings and slips about the middle of April. Six weeks later the harbor is full — a boat-watcher’s dream come true. 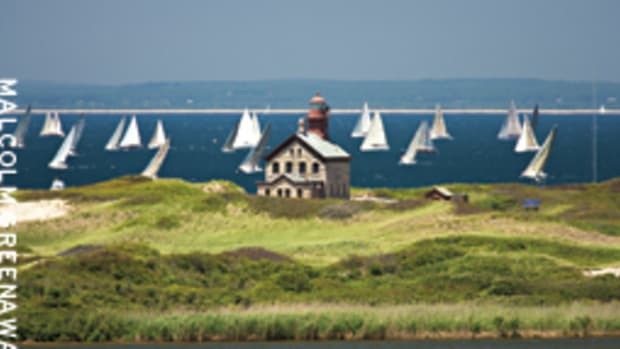 Among the many contemporary vessels, you’ll find vintage Bertrams, Huckins cruisers, Herreshoff S-Class sloops, Shields one-design sailboats, commuter boats from the 1930s and 12 Meter raceboats. During the Gilded Age, some of America’s wealthiest families retreated to their summer “cottages” in Newport. We’ve been lucky because the city government has preserved a lot of the waterfront for commercial marine use. This decision has allowed nine marinas to flourish. 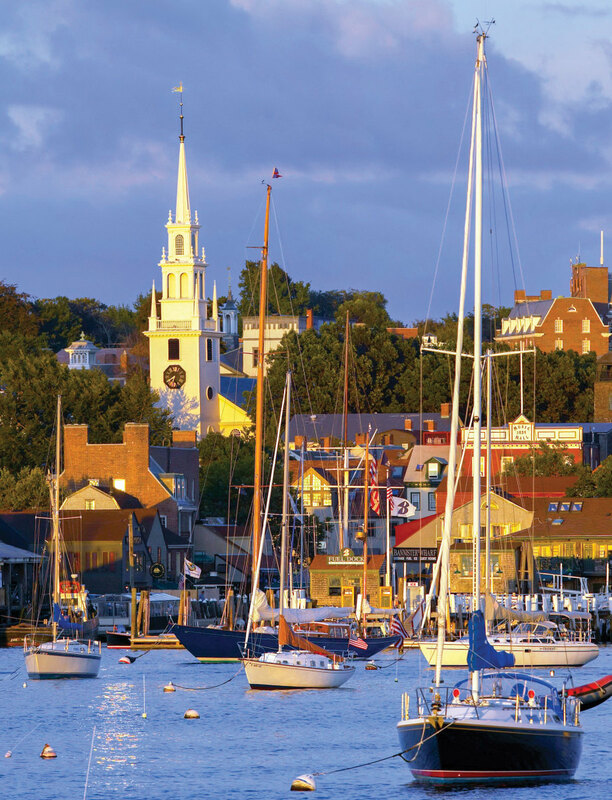 Newport Shipyard is on the western side of America’s Cup Avenue and a stone’s throw from Goat Island. A full-service marina, it caters to some of the world’s most spectacular superyachts. The second floor of the main building houses a variety of businesses, such as W-Class Yachts, Rodger Martin Design and Lyman-Morse brokerage. If you stop in to gaze at the big boats, J Class yachts among them, be sure to have breakfast, lunch or a snack at Belle’s Café. It alone is a good reason to visit. Coffee Grinder at the end of Bannister’s Wharf may be the smallest, funkiest coffee shop in the Northeast. It’s my favorite for a croissant and double espresso any time of year. In fine weather, sit on one of the Adirondack chairs outside and watch the comings and goings of harbor tour boats and fellow visitors while you sip and munch. If the weather is grumpy, hang out at one of the tables inside. Hopefully the owner is on duty when you call; her smile, good humor and energy can turn dread to delight. I’ve never had a bad meal at any restaurant in Newport. Among my favorites are sushi at the Clarke Cooke House, Bahamian fish chowder at Midtown Oyster Bar on Thames Street, breakfast at the Corner Café on Broadway, a Café Zelda burger at Zelda’s on lower Thames, and mussels and frites at the White Horse Tavern on Marlborough Street. If you want to see the best of real life in Newport, I recommend walking. The narrow streets and short blocks reveal the city’s Colonial character, and walking lets you stop to take in the history. Most of the period buildings bear a plaque that recounts its origins. Although pedestrians have the right of way in crosswalks, don’t take that for granted. Give vehicles a moment to register your presence before you proceed. So many attractions, so little time. 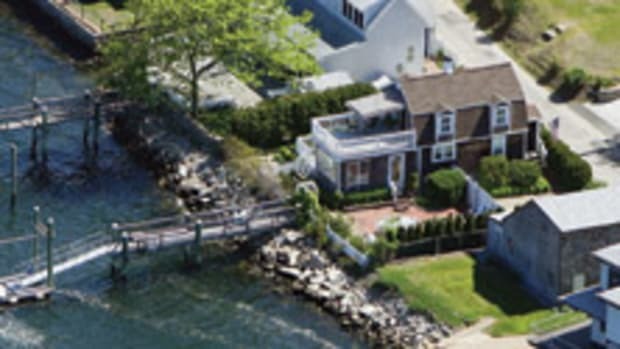 (The mansions are Newport icons.) 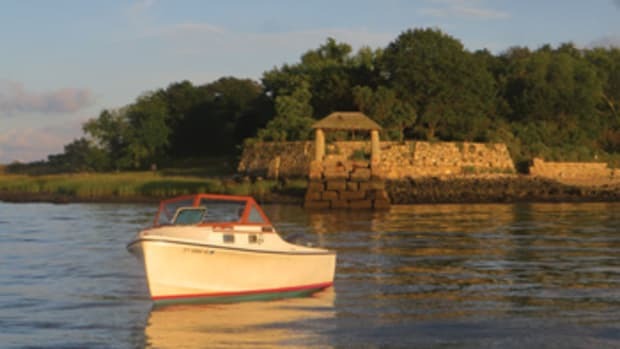 You’ll find a host of helpful information at discovernewport.org, but I urge you to use the site’s suggestions as a starting point. Mingle with the locals; a smile and a “hello” open many fine conversations. Visit often; you’ll feel Newport’s vibrance. 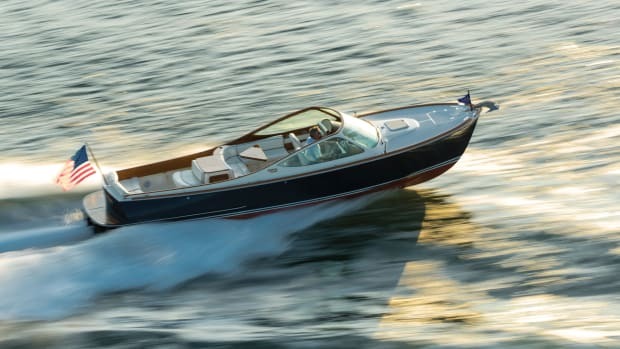 She’d suffered the ravages of an unsheltered life in the tropics — relentless sun, excessive humidity, rain — but the Hinckley Talaria 29 Runabout was still a gem. It’s rare to find a Hinckley in such rough shape — their owners tend to be doting. 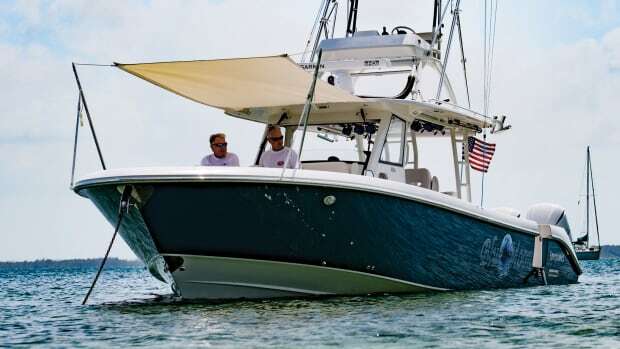 An Everglades center console with a shallow draft and 45-knot top end turns out to be the ideal platform for exploring the stunning Abacos islands.